Christmas is still a month away, but my Inbox is already full of annoyingly identical emails ‘Hi Ilona! Here’s our VERY UNIQUE gift guide, click to buy NOW’. Whilst hitting on the ‘Del’ button once again today, I figured, I might as well come up with my own gift guide! Agreed, I don’t have any clever software to magically discover what items you are most likely to desire (have you ever wondered why Amazon is so good at guessing what you might buy next? ), but some of you may find it at least entertaining, so I’ll give it a go. First topic on the agenda – boyfriend gifts. 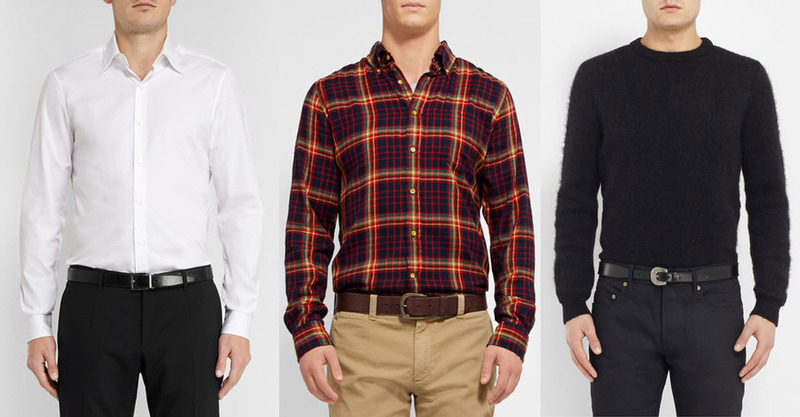 If you haven’t noticed yet, men’s belts are making a comeback. From James McAvoy to Brad Pitt, our favourite celebrity crushes opt for belted trousers, whether during casual or more formal occasions. With men’s accessories being one of the most popular gift items this season (and rightly so, very few men are patient enough to choose their own! ), here’s my guide on how to choose a perfect men’s belt. Whether you go skinny (1.5 – 2 cm) or classic (3 – 3.5 cm), preferred colours are black, dark brown or steel grey. 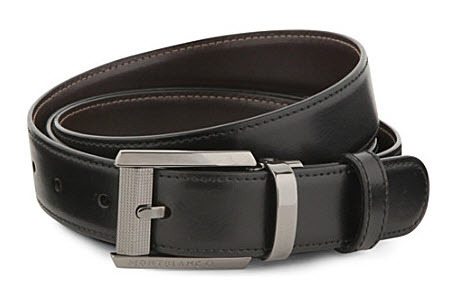 Many high-end brands, like Mont Blanc and Salvatore Ferragamo, do reversible designs, so despite a higher price tag you practically get two belts in one. For a fashion-forward guy, going for cracked leather or suede may be a welcome twist, but generally smooth leather works well with almost any outfit. Logo buckles are still out there, but their time is up. It may be cool to show off designer labels in his 20-s, but as he gets older and wiser, he’ll prefer less conspicuous brand references. A buckle needs to be robust enough, but it does not mean it should be big or heavy. I tend to ask male shop assistants to try belts on for me, it’s both practical and fun! No, no, I’m not being mean here. All I’m trying to say is, if you have an assigned budget for his Christmas gift, make your money work harder by investing it in one staple piece. I know, there are always temptations to get add-on gifts like aftershaves and iTunes vouchers, but resist. An extra 30 quid will make a massive difference to the quality of leather and design.